CCopasiTree class. The template class CCopasiTree describes a tree of Nodes. The template class CCopasiTree takes as template argument a class derived from the class CCopasiNode. It allows the construction of a tree with four simple methods. It assures that each node in the tree is unique. In addition it provides a forward iterator useful to traverse the tree. Note: The tree takes ownership of all nodes. Therefore, you must not use pointers to automatically created nodes in the attachNode() Function unless you use the detach node function prior to the destruction of the tree. Definition at line 37 of file CCopasiTree.h. Definition at line 59 of file CCopasiTree.h. Definition at line 250 of file CCopasiTree.h. References CCopasiTree< _Node >::mList, and CCopasiTree< _Node >::mpRoot. Definition at line 258 of file CCopasiTree.h. References CCopasiTree< _Node >::mpRoot, and pdelete. Definition at line 293 of file CCopasiTree.h. References CCopasiTree< _Node >::end(), CCopasiTree< _Node >::mList, and CCopasiTree< _Node >::mpRoot. Referenced by CCopasiTree< _Node >::moveNode(). 300 return false; // Node already in tree. 303 return false; // Invalid insertion point. 310 Success = false; // Invalid parent. Definition at line 264 of file CCopasiTree.h. Detach node. Node: After detachment of a node the tree no longer has the ownership. Definition at line 370 of file CCopasiTree.h. 372 if (!pNode) return false; // Nothing to do. Definition at line 270 of file CCopasiTree.h. Referenced by CCopasiTree< _Node >::attachNode(), CCopasiTree< _Node >::detachNode(), operator<<(), and CCopasiTree< _Node >::removeNode(). Retrieve the data of the Tree. Definition at line 282 of file CCopasiTree.h. Definition at line 276 of file CCopasiTree.h. 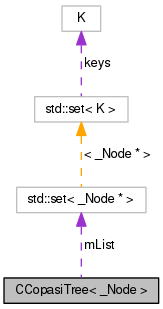 Move a given node from its current place in the tree to the one specified by pParent and pAfterChild. The insertion behavior is similar to addChild(). Definition at line 358 of file CCopasiTree.h. References CCopasiTree< _Node >::attachNode(), and CCopasiTree< _Node >::detachNode(). Definition at line 332 of file CCopasiTree.h. 334 if (!pNode) return false; // Nothing to remove. 336 if (pNode == mpRoot) return false; // Root must not be removed. The list of all nodes. This is used to keep the tree consistent by avoiding multiple inserts of the same node. Definition at line 72 of file CCopasiTree.h. Referenced by CCopasiTree< _Node >::attachNode(), CCopasiTree< _Node >::CCopasiTree(), CCopasiTree< _Node >::detachNode(), and CCopasiTree< _Node >::removeNode(). Definition at line 66 of file CCopasiTree.h. Referenced by CCopasiTree< _Node >::attachNode(), CCopasiTree< _Node >::begin(), CCopasiTree< _Node >::CCopasiTree(), CCopasiTree< _Node >::detachNode(), CCopasiTree< _Node >::getData(), CCopasiTree< _Node >::getRoot(), CCopasiTree< _Node >::removeNode(), and CCopasiTree< _Node >::~CCopasiTree().